He instructs spiritual seekers in mystical knowledge and the wisdom teachings. He translates the essence of ancient scriptural teachings in ways we can understand and live by today. Access to this knowledge, and how to apply it in our daily lives, is the gift Swamiji brings us. Those who listen and learn, gain great benefit. He is a hermit monk of the Advaita Vedanta order of India, who has been living the contemplative life of a monk for the past 50 years. Often living in a cave during the summer at an altitude of 10,000 feet at Gangotri, near the source of the river Ganges. 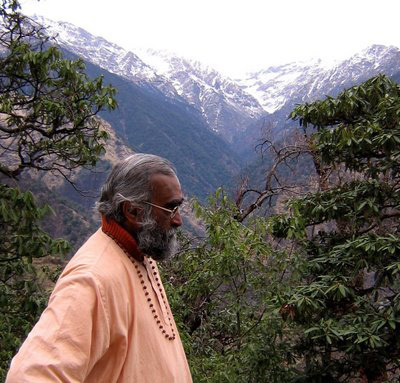 Swami Yogeshwarananda has led a deeply contemplative life since the 1960s when he left home at the age of 22 to live a secluded life of a hermit. His early years were spent in a systematic study of the ancient Sanskrit scriptures, which was taught to him by other scholarly monks. He followed the tradition of monks, living an austere life in a hut at the foothills of the Himalayas on the banks of the sacred Ganges in Rishikesh. Also he spent 10 years in the interior of the himalaya’s in Uttara-kashi with contemplative monks. He shares the ancient teachings transmitted in the successive line of teachers in the mystic tradition of India, as the swami’s personal guru was a mystic and scholar of par excellence. The wisdom he has gained reflects in his gentle way of teaching, causing one to reflect and gain insight into the pathless-path toward spiritual awakening. During the last 15 years, the Swami made an extensive study of the 4 Gospels, and the Sermons of Meister Eckhart. He says the gospels and the sermons have a mystical content which clearly expresses the non-dual wisdom knowledge leading to the divine experience within. The quintessence of eastern Spiritual wisdom is cryptically and tersely stated in pithy statements in the gospels. As such the Gospels is a text for mans spiritual guidance towards enlightenment. While the sermons of Meister Eckhart unravel the spiritual wisdom, the swami too, will unravel this wisdom in due course. Also the swami gives extensive teachings on the Upanishads, the Bhagavad Gita , the Yoga (aphorisms) Sutra’s of Patanjali in their philosophy and psychology and on Buddhism and conducts courses on meditation. The treasure house of ancient wisdom is locked. Swami Yogeshwarananda can unlock this treasury of wisdom, giving us access to the knowledge therein. Adept at translating and teaching this ancient wisdom, he brings it into the context of our lives today. Swamji skillfully brings to light the Truth that sets us free, and shows the WAY we can realise this Truth and experience the liberated state. Swamiji has delivered lectures and given teachings in many countries inc Australia, Switzerland, Germany, the United Kingdom and USA.